£1.23 for diesel at most of the petrol stations near me , good price. I am awaiting the supermarket fuel naysayers to chime in. Here we go again! Your loss mate. If you are going to leave such comments at least say why - don't like the smell or something? One cold deal in 2 years and we're supposed to respect your judgement! £1.08 at Sainsburys in Tamworth last week & £1.05 the week before that. 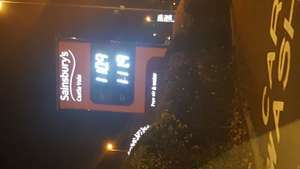 Don't think Asda still do, seen 2 Asda fuel stations within 40 miles of each other displaying different prices. Here we go again! Your loss mate. If you are going to leave such …Here we go again! Your loss mate. If you are going to leave such comments at least say why - don't like the smell or something? One cold deal in 2 years and we're supposed to respect your judgement! What does put me off with Sainsbury's is when you see the DHL tanker pulling up, at least the others have their own tankers. Don't think Asda still do, seen 2 Asda fuel stations within 40 miles of …Don't think Asda still do, seen 2 Asda fuel stations within 40 miles of each other displaying different prices.What does put me off with Sainsbury's is when you see the DHL tanker pulling up, at least the others have their own tankers. Sounds like false economy to me, unless you actually live local. What are you saving on a full tank? £6 at the most? Hardly worth going out of your way or putting up with the inconvenience of long queues. Good price and voted hot for what it is, but it is truly only of benefit to those who live very close by.